Yuki Ito of PETRONAS Hong Leong Yamaha displayed solid performance in the first race for the Supersports 600cc category with a sixth place finisher in 27:44.523s. The young Japanese successfully sidelined a number of riders ahead of him on the grid after a poor qualifying that had him start out of the top te position. Finishing in 27:44.739s, about 13 seconds behind winner Yuki Takahashi, Ito however failed to finished the second race in the afternoon when the rider crashed out in lap 6. Ito’s teammate, Mohd Fitri Ashraf Razali crossed the line in 16th (28:22.910s) ahead of Ahmad Afif Amran in 18th (28:23.876s). The closest Yamaha machine to finish Race 1 behind Ito was WSBK rider, Mark Aitchison who stated prior to the battle that he will push forward this season for a tough but possible championship campaign. The Yamaha Finson Racing rider finished 11th in 27:49.715s while his fellow Australian riders, Aaron Morris and Michael Blair (Finson Motorsports Australia) came home 14th and 15th respectively. Race 2 meanwhile had Makoto Inagaki fighting with the frontrunners and crossing the line in fifth with a total of 27:55.293s. Aaron maintained his 14th position while his teammate, Michael finished 16th. Afif improved slightly in 17th (28:17.773s) while Fitri came home behind him in 28:22.691s. Ito sits at 13th overall with 10 points leaving Afif and Fitri to fight for their position in the second round of the championship. With grid positions scattered all over, Yamaha’s championship conquest with the new bikes and riders was not an easy feat in Sepang. Ayumu Tanaka of Akeno Speed Racing came home the best rider on the R25, sealing in 6th position in both Race 1 and Race 2 with a mixed bad of Yamaha riders finishing behind the Japanese. Ayumu clocked in 20:52.934s in the first race and 20:53.647 in the second. In Race 1, Thai teammates Peerapong Boonlert and Peerapong Loiboonpeng (Yamaha Thailand Racing Team) gave a strong display of competitiveness with a seventh and eighth position ahead of Yamaha Finson Racing’s Kasma Daniel Kasmayudin who finished ninth in 20:53.316s. With so little practice time, Kasma seemed to be one of the best batch of fresh riders to make an impact in this series. 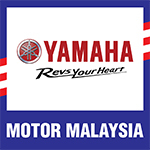 Mohd Izzat Zaidi (RCB Yamaha YY Pang Racing Team) came in 17th while Felda PB Racing’s Mohd Fairuz Nasir crashed out in the third lap. Race 2 saw Kasma moved a notch higher finishing in eighth (21:01.937s) behind Indonesia’s Rusman Fadhil of Yamaha Yamalube KYT Tunggal Jaya. Coming back for a crash in the previous race, Fairuz finished 21st in 21:24.201s while Izzat maintained a constant performance in 18th in 21:18.300s. Ayumu sits in sixth overall with 20 points behind chart leader, Apiwat Wongthananon while Kasma in seventh with 15 points while Izzat and Fairuz will have to make a comeback in the next round to collect valuable championship points. 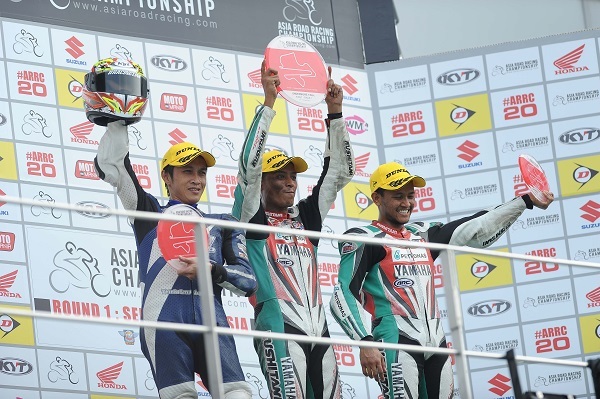 Wildcards Abdul Muhaimin Rosland and Ahmad Fazli Sham made their Malaysian supporters proud as the PETRONAS Yamaha Maju Motor duo each took a win in the Underbone 130cc category in the opening round of the 2015 FIM Asia Road Racing Championship at Sepang. Fazli Sham won Race 1 in 19’14.112s ahead of Indonesian rival, Hokky Krisdianto and Muhaimin who timed 19’17.966s and 19’17.995s respectively. The seasoned contender was hoping to score another win in Race 2 but his engine gave in with three more laps to go and this gave Muhaimin the perfect opportunity to steal the chequered flag in 19’17.609s. Norizman Ismail (Harian Metro Y-TEQ SCK Honda Racing) made up for the crash he suffered in Race 1 and finished second in 19’17.642s while reigning Underbone 130cc champion, Gupita Kresna (Manual Tech KYT Rextor) took third in 19’17.732s. Having finished both races on the podium, Muhaimin leads the Underbone 130cc standings with 41 points ahead of Hokky and Fazli Sham with 33 points and 25 points respectively.